Below you’ll find answers to some of the common questions that our customers ask about our products and services. If you can’t find the answer to your question below, please do not hesitate to Contact Us – We’ll be more than happy to help. Generally we cover all areas across Devon and Cornwall, including Bideford, Barnstaple, Torrington, Westward Ho!, South Molton, Bude and beyond! Although we are based in the South West we are happy to travel pretty much anywhere in the UK – The furthest we’ve been so far is Scotland! Of course, distance is dependent on the amount of work involved. We do not offer quotes over the phone. In order to give you a realistic quote, we prefer to visit the job to assess the work so that we can provide you with a quote which is our best possible price at that time. Is your work covered by a guarantee? Yes – We are proud to be FENSA registered and a Member of HomePro, who provide all of our customers with a 10 year insurance-backed guarantee. 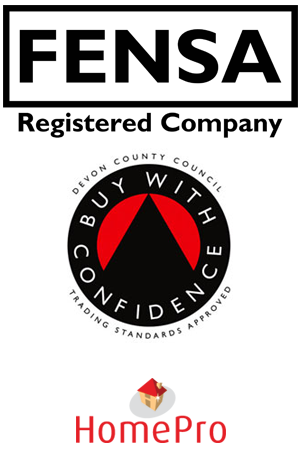 We are also members of Devon County Council’s “Buy with Confidence” scheme – an official certification of quality, value for money and customer care. How does payment work - do you require a deposit? Generally, we take a deposit of 40% on large jobs prior to work commencing – this is always agreed with the customer at the time of ordering. Payment must be made within 14 days of the invoice date. Your quote will provide full details of the work included in the given price. Any additional work and costings will be agreed with the client before carrying out the work. Looking for answers and information about common double glazing problems?